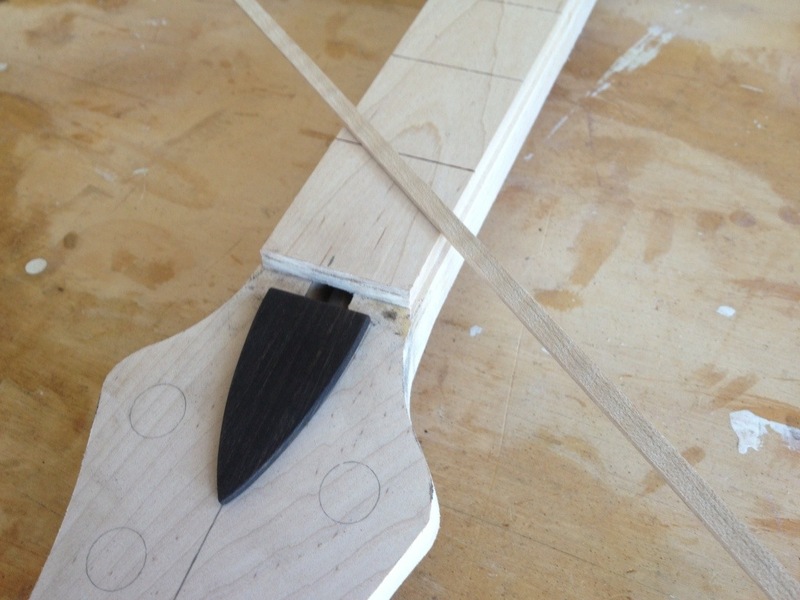 This is the existing template from Seth Horan’s bass, so there will be some modifications to the upper horn. I believe this is my first bass made from one piece of wood. 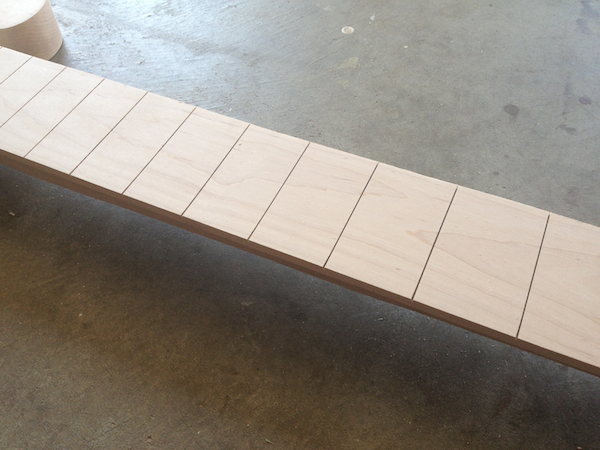 I bought an 8′ long piece of maple that I will be able to be use for the body, neck and fretboard. 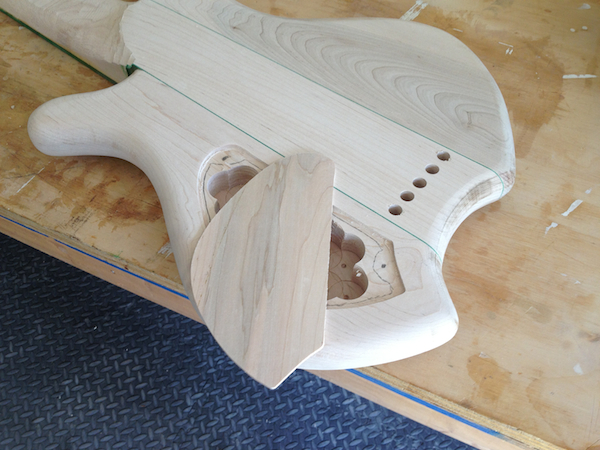 We decided to make it a neck-through instead of bolt-on, with a green veneer between the neck and wings. Everything is just rough cut at this point. 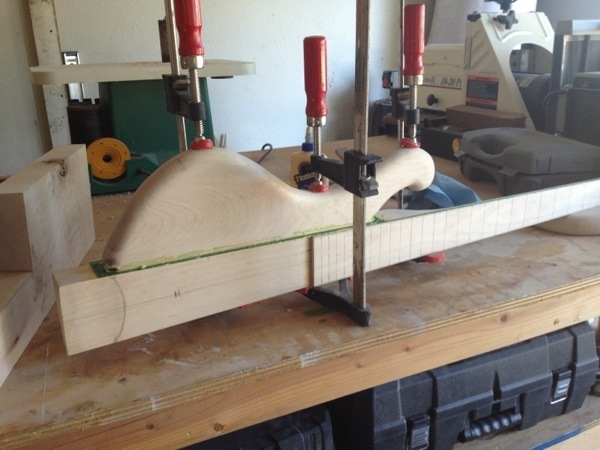 Today, I was able to true the sides of the neck and the sides of the wings so that they will be ready for a tight glue joint. 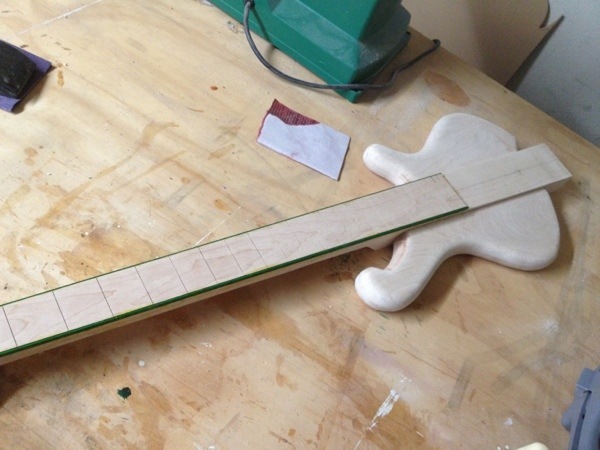 Then I milled a fretboard (from the same original board as the rest of the bass) and cut the fret slots, 26 in this case. Lastly, I started the body shaping. 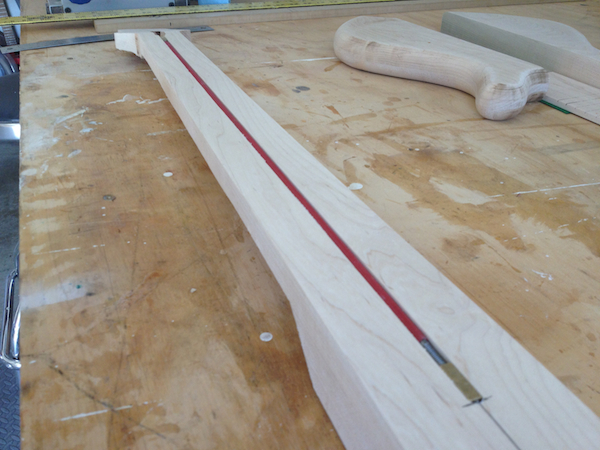 The truss rod came in the mail so I was able to route the slot for it, glue on the fretboard and then trim the fretboard flush with the neck. 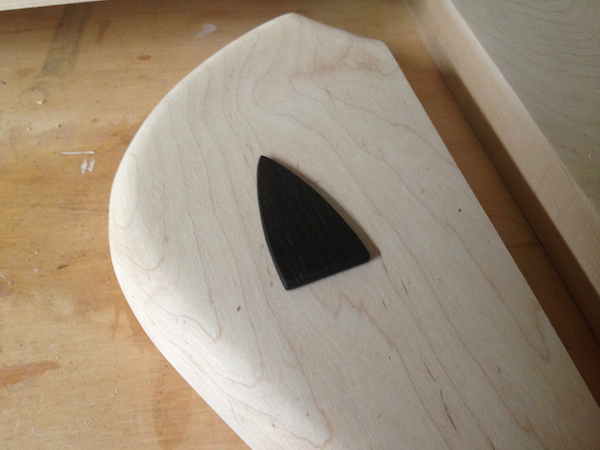 While the glue was drying I made the truss rod cover as well. I apologize for the lack of updates, I’ve been waiting for some back ordered parts to come in. 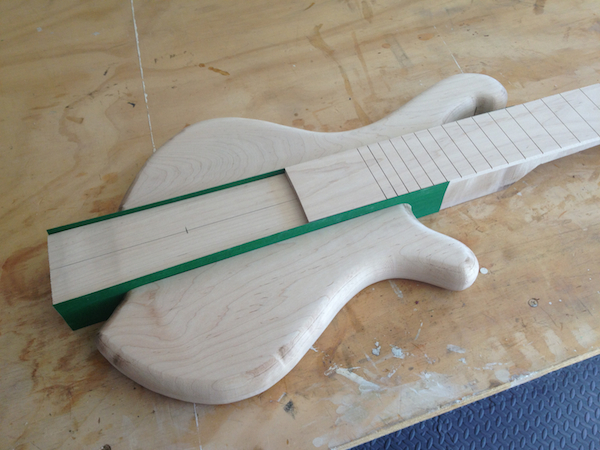 We’ve also made some changes like adding green maple binding to compliment the green veneers between the neck and wings. I got the green dye in today and was able to get 2 coats on the maple binding. 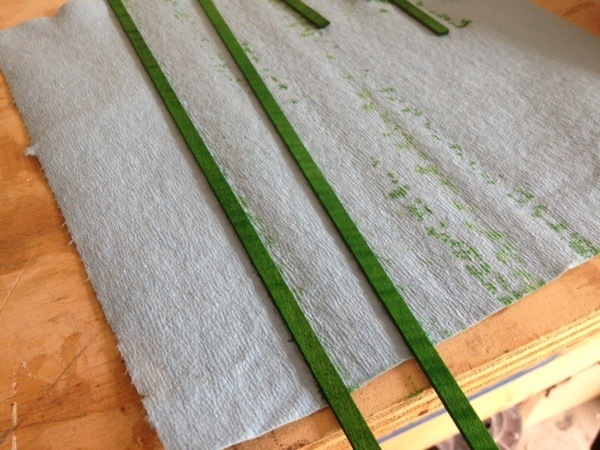 The green dyed binding has been glued on, each of the body wings have been glued to the neck with a green veneer between them, the neck has been rough shaped and the tuner holes have been drilled. Pickup cavities and bridge cavity have been routed. 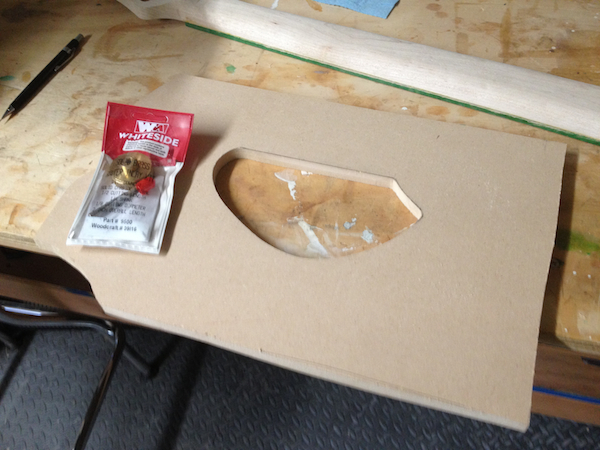 Once the control cavity is done, I’ll start cleaning up everything and getting into the fine work. 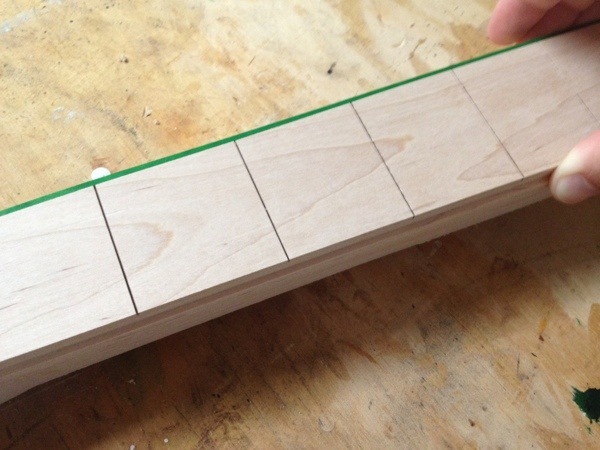 I made the control cavity template and used an inlay router kit to make a perfect fit. The inside has just been roughed out. 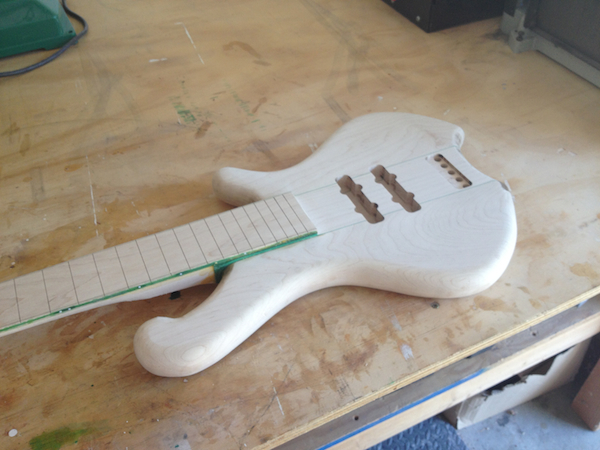 The main part of the control cavity has been cleaned out, belly and arm contours roughed out as well as the neck/body transition. After a very long break from bass building, I am back at it finishing up this bass. There have been a few changes to the design, mainly that everything is now dyed turquoise besides the fretboard!